To optimize the commuting experience, I need a high quality seat. What represents a high quality seat? For me, it's the aisle of a three-seater, no one in the middle, no bottles rolling around on the floor, and no sticky mystery liquid under my shoes. What's interesting about that? Probably nothing. Bad seats make more interesting blog posts. Just as you can go to an event in a stadium or arena and get stuck behind a pole or a person with a tall hairdo, you can board public transportation and have a lousy experience because of where you sit. Today's post is about the worst seat in the house on trains and buses. I'm going to tell you about the worst train seats. Our North Jersey Bus Correspondent, Chintan, will tell you about the evil of the final bus row. Let's start with trains, shall we? Any seat in the six-seater. Unless your travels involve five other people you know, sitting in the six-seater stinks. There is a row of three seats facing another row of three seats. The legroom between them is minimal. Unless you keep perfectly still, you will find yourself playing foot games with the person across from you. See the guy without a face drinking a cheap beer in the photo for an illustration. While any seat in the six-seater is awful, a middle seat in the six-seater is even worse. No legroom and no elbow room. I'd rather ride on top of the train car where I'd catch a nice breeze while ducking to avoid overpasses. The vestibule. Some people will make do when there are no empty seats by sitting in the vestibule. There's no way I'm doing this, especially in the winter. The train floor gets grimy with salt, snow, slush, etc. I suppose it depends on just how badly you need to sit. Better bring a lot of Purell. The wheelchair accessible benches. The newer M-7 train cars have an area near the vestibule where benches fold down for able-bodied people, but fold up so that wheelchair-bound folks have a place to park. I never sit on those benches. Why? I don't think they really want people to sit there, because they're not designed for humans. The angle of those seat backs make you lean forward a little, just enough so that by the time you reach your destination, you feel about 100 years old. I'd rather stand. Let's switch over to the buses now. Chintan told me about the dreaded final bus row. During rush hour, buses fill completely. If you're lucky, your fanny won't land in the final row. The Evil Seats of the Final Bus Row. Talk about a rock and a hard place. For those of you who may not be aware, typical New Jersey Transit buses have eleven rows with four seats (aisle in between), and a twelfth row with five seats. The twelfth row is the hell row. The evil seats reside on either side of the middle spot, and you're better off walking to work or calling in sick. The last row's seat back is 90 degrees with no incline. Depending on the bus make and model, the row is adjacent to engine or the air conditioner, maximizing noise and odor. The row hangs off the back of the bus behind the rear wheels. Lucky twelfth row denizens get a roller coaster ride, without the headache of going to an amusement park. That's just the row. Let's look at the evil seats. 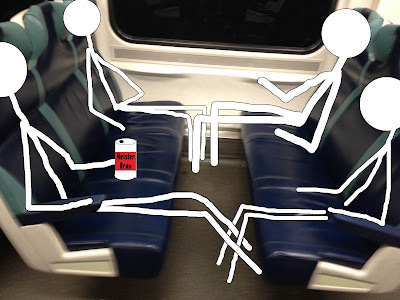 In the two seats designated by red arrow in the crude drawing, you are completely helpless and out of control. You are squashed between the center and window seat occupants with your bag in your lap, praying there's no traffic. The only alternative is to stand for the entire length of your commute or until someone gets off. Standing on a bus is not fun. A bus has to maneuver along highways, make turns on local roads, bounce over potholes, curbs, etc. Try navigating that while reading or playing on your smartphone. The good news is that your day will only get better after sitting in.... the Evil Seats of The Last Row. Thanks Chintan for your contribution. 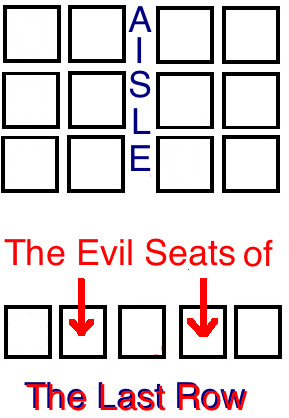 The evil seats of the back row sound a lot like the evil middle seat on the train. There's no easy commute anywhere, it seems. Keep sharing your travel tales, either by email or using #TTIV on social media. Commuting is a lot easier when we share and compare stories. on the train I take home there is a group of drinkers - the loud, obnoxious sort - that love those seats. I guess they're great for partying and catching up with people you haven't seen in 10 hours. Ha! so true. A good rule is to avoid people in the 6-seater who know each other. If they have alcohol, all the more reason to go to the next car. Don't forget the seats by the bathroom. The suffocating stench alone is enough to make me want to get off a few stops early. Plus there are always people trying to get by in the narrow walkway. The other bad thing about the evil seats in the back is that if the engine catches on fire, you're at risk of being burned and all your stuff will get ruined. I found this out first-hand on a MegaBus last year. Luckily I was sitting toward the front and brought all my stuff with me when we smelled smoke. Once the explosions started, some people never saw their luggage again. At least, not in one piece. Wow. It's been years since I last commuted by bus. It sounds like experience as about the same. I'm glad you got out before the situation you described got more dangerous.